Last week proved to be a big week for BlackBerry, and the gains are continuing into the start of this week. The reason for the upward movement that we’ve seen on the stock as of late is the release of a new smartphone. That phone is known as the DTEK50. This new offering follows along the same lines as the Priv in the sense that it uses the Android operating system. The new DTEK50 from BBRY is a touchscreen device that is designed without the signature QWERTY keypad. According to the announcement made last week, the new device will have a price tag of $299. Perhaps the most important statement made with regard to the DTEK50 upon its release revolved around security. BBRY has touted its newest offering as the most secure Android phone on the market today. The company says that the security included in this phone is a potential game changer. To be honest, I don’t think so. Don’t get me wrong, I do believe that BlackBerry will do pretty well when it comes to the sales of the phone. However, a game changer, it is not! In fact, the security statement made by the company is most likely a marketing gimmick. In fact, from all I can see, the new DTEK50 comes with the same level security as the Priv. Nonetheless it is an interesting statement. With that said, as mentioned above, I do expect to see strong sales from the phone. Not because it is the most secure Android phone on the market, but because of how it is being marketed. The new DTEK50 is being marketed as a fleet device instead of a premium device. One thing that the BBRY noticed during the launch of the Priv is that the price point of the phone was too high for companies to want to purchase them for employee use. However, they have drastically cut the cost with the DTEK50. This ultimately makes it a more promising offering when it comes to fleet usage. So, this should lead to relatively strong sales. As mentioned above, BBRY has had a strong run in the market since the release of the DTEK50. The gains we’ve seen on the stock are continuing today. Currently (2:39), the stock is trading at $7.88 per share after a gain of $0.28 per share or 3.62% thus far today. Moving forward, I have a relatively bullish opinion of what we can expect to see from BBRY. While the company has an uphill battle in the smartphone industry, I do believe that the push to produce Android products is going to work out in the long run. Also, I’m incredibly impressed with BlackBerry’s push toward software and security as there is quite a bit of value there for the company. All in all, we may not see exponential growth any time soon. However, I do believe that we’ll see slow and steady growth making this a strong long investment. 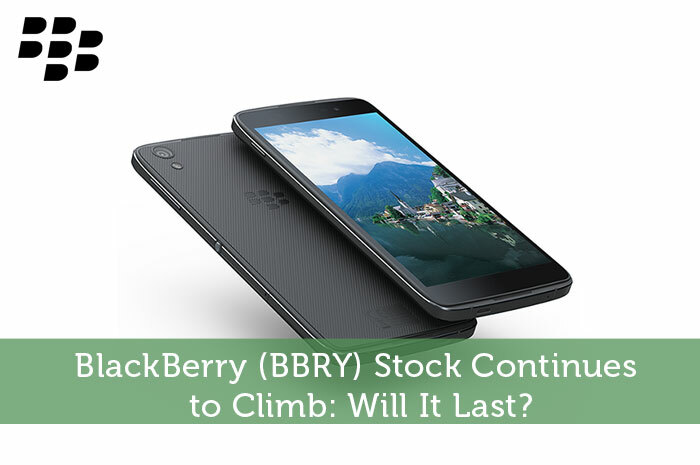 BlackBerry (BBRY) Stock Continues to Climb: Will It Last? I don’t think it is going to make a big difference, Blackberry had it’s time but since android took over the market and the BBM messenger was made available on all operating systems, it will take a whole lot to get the Blackberry brand back close to anything that it used to be.